Top-producing B2B sales professionals speak for an average of 46% of the call and listen for the other 54%. It’s apparent that listening more and talking less is a key to sales success. The problem is that the average sales professional is only allowing for listening during about 28% of each call. 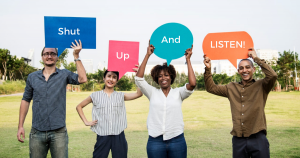 Award-winning scientist and Founder of Cerebral Selling David Priemer shared five simple tips to improve your listening skill set and become more successful in episode 12 of INSIDE Inside Sales, Is anybody listening? David says quality discovery requires quality listening so that you can lose fast and win fast. Isn’t that what we would all choose over drawing a loss out longer? The problem with talking more than you listen is that you’re not hearing the pains, problems, issues, and challenges that your customer is sharing. This is the good stuff, the important information that can help to improve the value proposition. Stop talking. Resist your urge to talk and give the prospect or customer time to speak.Pro tip: If you need a reminder, David suggests placing a sticky note with the word “Listen” written on it near your phone or monitor. Make eye contact. Use video if the person is open to it. David says video helps to break down emotional barriers and helps you listen better. Not only are you putting a face to your voice for the customer, but you’ll learn more about them too. It also eliminates multitasking on both ends.Pro tip: Shrink the video size and move it just below your camera so that you can see the customer’s body language and look into the camera at the same time. Write it down. Not only is it easier to recall facts later if you’ve written them down, but the act of capturing these details demonstrates that you are interested in the insights the other person is sharing.Pro tip: If you’re not on a video call, tell them when you’re writing things down throughout the conversation. Recap what they say. It shows you are actively listening.Pro tip: Repeat what the other person said using their exact words. Mirroring the prospect or customer proves that you wrote down what they said and it’s scientifically proven to improve affinity. Ask thoughtful follow-up questions. Replying with a flat response then moving on to the next question makes it obvious you are moving through a list. When you pose a good follow-up question, it opens the call into a conversation.Pro tip: Prepare open-ended questions that will naturally lead to a good follow-up question. David insists that customers “don’t buy products, they don’t buy ROI. They buy feelings.” They’re essentially buying into you because you proved yourself trustworthy. It’s the experience, not necessarily the product or service, that influences a person’s decision to purchase. The listening tips David shared during my podcast can be applied to virtually any conversation, not just sales. However, I’m not suggesting you whip out a notepad the next time you’re talking to your spouse or a colleague. How do you keep yourself focused during sales conversations when it’s difficult to pay attention? Let us know in the comments below. 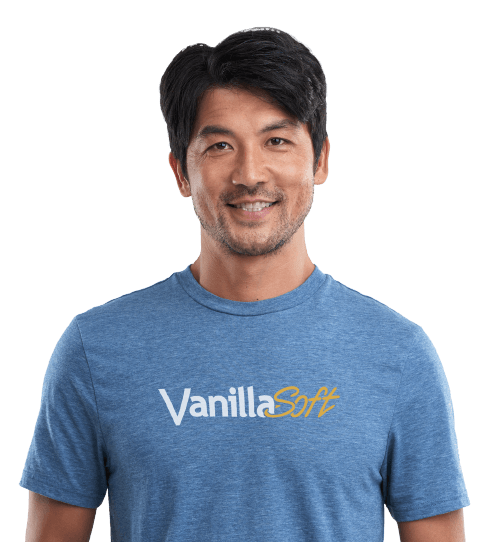 Darryl Praill, Chief Marketing Officer of VanillaSoft, is a high-tech marketing executive with over 25 years’ experience spanning startups, re-starts, consolidations, acquisitions, divestments and IPO’s. He has been widely quoted in the media including television, press, and trade publications. He is a guest lecturer, public speaker, and radio personality and has been featured in numerous podcasts, case studies, and best-selling books. Praill is a former recipient of the coveted Forty Under 40 Award, and has held senior executive roles in leading companies including Sybase, Cognos (now IBM), webPLAN (now Kinaxis), and CML Emergency Services (now AIRBUS). He has raised over $50 million in venture funding across multiple organizations and consulted with world-class corporations including Salesforce, SAP, and Nielsen. He is a Computer Science graduate from Sheridan College.